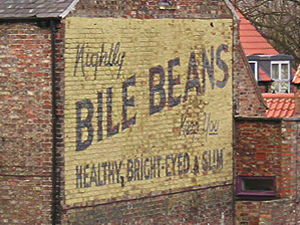 The Bile Beans sign is often referred to now as ‘iconic’. If it is, I guess that’s largely to do with the fact that an artist painted it 30 years ago – that is, created a representation of it on paper/canvas. The painting was exhibited in the art gallery in 1982, and later sold as a print. As the Evening Press put it, on 1 May 1982: ‘a well-known patent medicine, painted on a York gable-end, has been immortalised by an enterprising artist’. Baz Ward depicted the authentic ad, and Andy Tuckwell captured it on camera. They and others who were around and paid attention back then saw the proper ‘ghost sign’, fully revealed when hoardings that had obscured it were taken down. The ad on the wall was repainted in the 1980s, so the version we’ve come to know and love isn’t that ‘authentic’. A lot of people are pleased about the recent repainting. Others are not. On Twitter, Daniel Benneworth-Gray asked ‘What next, a fresh coat of magnolia on the city walls?’. Replies agreed that the Bile Beans repaint was ‘Like an old friend having bad plastic surgery’ (Nick Statham) and that it had been ‘robbed of all its charm’ (thisnorthernboy), plus other comments too rude to quote. Then, as now, most people seem to have been pleased with the newly-painted sign. Then, as now, a smaller number felt it had been ruined. My first reaction on seeing York Arts Forum’s so-called ‘restoration’ of the Bile Beans sign in York was to reach for my brushes and ladder to replace the initial ‘B’ with a ‘V’. Better counsel prevailed. While delighted that my opinion of their action has been published in Pressman’s Diary, I must protest that I have been misrepresented to some extent. Firstly in the piece headed Artist’s Viewpoint readers may have been given the impression that I was ‘not too happy.’ This is far from the truth. In fact I was both furious and deeply disappointed. I regard this ‘restoration’ as thoughtless, insensitive, amateur and an act of public vandalism; neither am I ‘delighted that the sign will live on’ as I consider it to have been destroyed and replaced. Secondly, under the heading Bilious Debate, it was stated that I wished the sign to be left as it was. This again is untrue. It was certainly in need of some remedial treatment, so that this much loved landmark did not disappear. To keep its faded and subtle character, while stabilising and preserving it, would have been no easy task, but not impossible. I only now regret that much talk on this matter by myself and others was not turned into action long ago. To reiterate my view stated on September 16, much of the mural’s beauty lay in its faded condition, the resultant colours and textures. It was genuine and showed the passage of time. Residents and visitors alike took pleasure in its ‘discovery’ for themselves; it engaged the eyes: now it assaults them. If I found a Rubens or a Constable in my attic I would certainly have it restored, but with extreme care, by experts, not slap paint all over it in my own garish colours. I must admit to being surprised at York Arts Forum’s messages of congratulation, for of the many, many people with whom I have discussed the matter since the dreadful deed, only one, the wife of a YAF member, seemed pleased with the result. All the rest have shown varying degrees of disgust, sadness and anger. Raises many questions, doesn’t it, regarding the ‘preservation’ of our history. Many people feel they’ve just witnessed the crass destruction of an original ‘ghost sign’. We haven’t – it happened a few decades back. Other people feel something has been preserved, that it’s an important part of our heritage. I guess it is part of our heritage, this 1980s repainted version. But like all things in York, it has layers beneath. Personally I’m just grateful to the artists and photographers who see beauty in the ordinary, and at the right time capture the soul of things, before it disappears. With thanks to Baz Ward. There are several other pages on the Bile Beans ad. Thanks so much for all this. 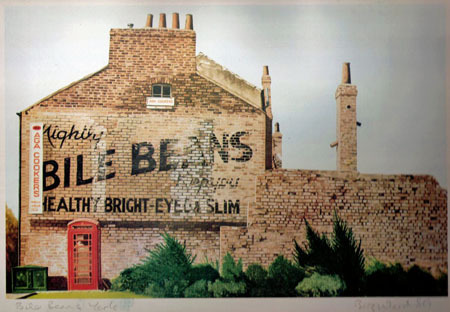 I have always admired the Stubbs painted advert on the wall of their old Fossgate shop (now the Loch Fyne restaurant). I talked to the workers when the shop was being altered and they said the wall painting was going to be restored ‘cracks and all’. The Stubbs adverts were restored, but I don’t think ‘cracks and all’ – not sure how you restore cracks! Am pleased you enjoy the site, thank you. Hello Baz, David here I still have the 4pics’ that you gave my mam(Eleanor) I got them when she died. I love them and will never part when mam died all the MITCHELL paintings had to be sold. However the largest group are in MARYPORT. MARITIME MUSEUM. Hope you read this and are in good health. I don’t know about your ma (AUNTY JOAN) AS one tends to drift apart given the circumstances. My address is still.